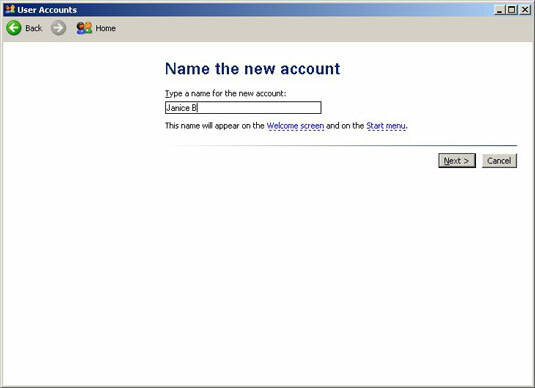 You can create a new user account in Windows XP for anyone: your spouse, your children, your babysitter, your in-laws . . . well, don’t go too crazy. By creating new user accounts for the people who will be using your computer, you allow everyone to switch between users as well as customize their experience with Windows XP on just a single computer — all without having to shut down the computer for each new user. Each time you create a new user account, follow these simple steps. The Start button is located at the bottom-left corner of your screen. 2Double-click the User Accounts link. 3Click the Create a New Account link. You can find the New Account link in the “Pick a task . . .” list. 4Enter a name for the account. Click Next after your enter a name for the account. 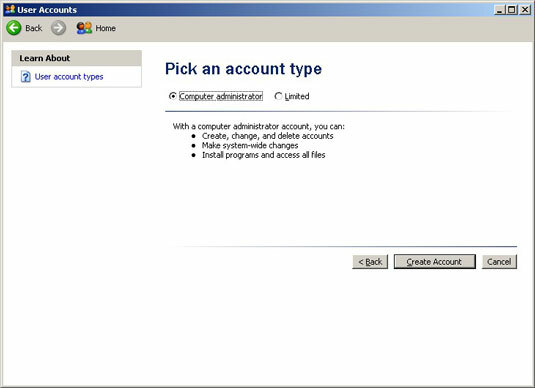 5Select the type of account you want to create for Windows XP. A Computer Administrator can do things like create and change accounts and install programs; a Limited user can’t do those tasks. 6Click the Create Account button. This button is located at the bottom-right of the “Pick an account type” screen. You can do this by clicking File→Close or by simply clicking the “X” at the top-right corner of the Control Panel screen.